NAIROBI, Kenya, August 19, 2010 (ENS) – Giraffes of an increasingly rare sub-species have been just been classed as Endangered by the International Union for the Conservation of Nature on its authoritative Red List of Threatened Species. The Rothschild’s giraffe, one of nine recognized giraffe sub-species, now numbers fewer than 670 animals in the wild, the IUCN says. There are less than 470 individuals in Uganda and Kenya, with an unknown number in southern Sudan. The IUCN said in its listing that the population of Rothschild’s giraffe is potentially close to meeting the population threshold for listing as Critically Endangered depending on the number of individuals, if any, that survive in south Sudan. 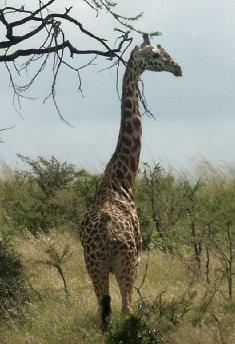 The Endangered listing is based on a new assessment by giraffe specialists Julian Fennessy and Rick Brenneman. Based in Nairobi, Dr. Fennessy serves as executive director of the Kenya Land Conservation Trust and he is founder, trustee and principal investigator at the Giraffe Conservation Foundation. Dr. Brenneman serves as conservation geneticist at the Henry Doorly Zoo in Omaha, Nebraska. In Kenya, all known wild populations of Rothschild’s giraffe have been eradicated by agricultural development and remnant populations are confined to National Parks, private properties and other protected areas, the researchers said. These remaining populations are physically isolated from one another making it impossible for them to interbreed. Population growth is further hindered as a result of the closed nature of these conservation areas which have reached or exceeded carrying capacities, they explained. 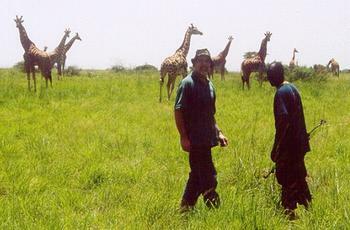 For their Rothschild’s giraffe population assessment the researchers used field work as well as survey estimates by the Uganda Wildlife Authority and Kenya Wildlife Services. “This has already been done in a joint project between UWA and KWS in augmenting the giraffe population at Kidepo Valley National Park with Lake Nakuru National Park individuals,” he said. Fennessy credits the Kenya Wildlife Service for launching a National Giraffe Conservation Strategy, the first giraffe-focused conservation action plan of its kind. This strategy will work to conserve all three of the giraffe sub-species found in Kenya, in particular the endangered Rothschild’s giraffe. Its development marks a first in giraffe conservation and raises awareness of the significance of, and urgent need to conserve these animals, he said. Sixty percent of the world’s remaining wild population of Rothschild’s giraffes are found in Kenya, with the remainder in Uganda. The only remaining naturally occurring population occurs in Murchison Falls National Park, Uganda. According to the IUCN Red List, there were an estimated 2,500 individuals in Murchison Falls National Park in the 1960s, declining sharply to 350 in 19821983 and 250 in 19951996. The current population in Murchison Falls National Park is estimated to be of 240 individuals and stable. 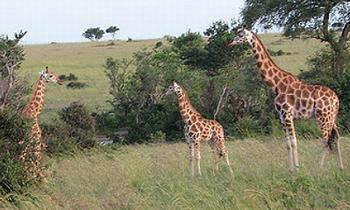 Rothschild’s giraffes have been re-introduced to six sites in Kenya – Ruma National Park; Mt. Elgon National Park; Murgor Farm, Iten; Sergoit-Kruger Farm, Iten; Kitale Area Farm; Nasalot Reserve. The reintroduced population in Ruma National Park is estimated to be of 130 individuals and is declining due to poaching. Numbers at each of the other five reintroduction sites are of 10-20 individuals and some of these are unlikely to be viable. Rothschild’s giraffes have also been re-introduced to one site in Uganda, in Kidepo Valley National Park, which is within the native range. The Rothschild’s giraffe, Giraffa camelopardis rothschildi, is named after Lord Walter Rothschild (1868-1937), a British banker, politician, and zoologist. He was the first to describe the giraffe, a subspecies with five horns instead of two. Two of these horns are at the top of the head, as all giraffes have. The third horn can often be seen in the centre of the giraffe’s forehead and the other two are behind each ear. Rothschild’s giraffes are taller than other sub-species, measuring up to six meters (20 feet) tall and their markings are paler and creamier in color than other sub-species, with no markings on the lower legs. To conduct research on this little-known sub-species, the Rothschild’s Giraffe Project has been established in Kenya’s Great Rift Valley, to survey Rothschild’s giraffe behavior, ecology and social structure. 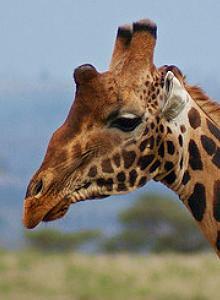 A project of the Mammal Research Unit in the School of Biological Science at the University of Bristol, England and Kenya’s Soysambu Conservancy, researchers are working with Kenya Wildlife Service and others to develop a conservation strategy for the Rothschild’s giraffe in East Africa. The Giraffe Conservation Foundation is actively supporting the Rothschild’s Giraffe Project as well as other giraffe research across Africa with the provision of technical support and funding, as well as sharing data and results for a comprehensive approach to giraffe conservation.